Co-Optimus - News - Xbox One November Update Looks To Change The Way You Play With Friends. Xbox One November Update Looks To Change The Way You Play With Friends. One big step for the future of playing together. November looks to be a big month for Microsoft, with its Xbox One side of things thanks to a major update that will be bringing backwards compatibility to the general public and an upgrade to the systems UI. This revitalization to the system is being powered by Windows 10 and looks to be the biggest and most user friendly update in the Xbox Ones history. Along with those two key features another major update will be to the social side of things with a more social-friendly community section being added to the dashboard. Microsoft feels that who is online is extremely important to the future of gaming and want to make it a core of the Xbox One experience. The new look of the dashboard will have a way to help gamers join conversations with friends and the community as they are happening in that moment. The new Activity Feed will look to keep up with friend’s actions and favorite games easier. Along with that there will also be a trending section added that help keep you in the know of what everyone is playing. 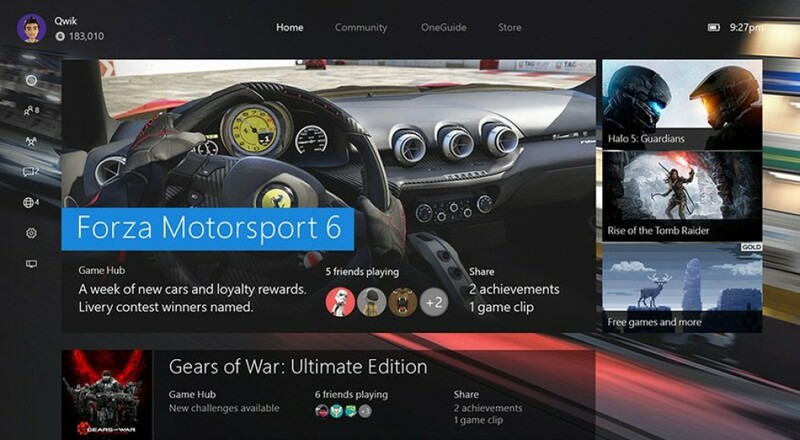 The new update is being called ‘The New Xbox One Experience’ and looks to center on and overhaul the systems OneGuide for a more favorable experience. If you are a member of the Xbox One Preview Program some of these features and updates have already become available with the option to update or stay with the old features until the full release. There will be improved builds of the updates rolling out until the official release. Below you will see the list of all the features with details of what each feature will do to improve your gaming experience. A new Guide lets you quickly access essentials with just one button press to save time spent weaving in and out of apps. You can access the Guide from Home by pressing left or double tap the Xbox button on your controller to instantly overlay the Guide. You can access Friends, quickly start a Party, get to Settings, see System Notifications, view your Messages, and more from Home or without leaving your game. These are the top tasks Xbox fans do most often, so we focused on making them faster and easier to get to without disrupting your game. We’re optimizing Store to help you quickly find the content you want. To the right of OneGuide, you’ll find the new and improved Store with features including four easy to explore areas – Games, Movies & TV, Apps, and Music – and a new vertical gallery view to bring more listings at a glance. Browse through intuitive categories like Staff Picks, New Releases, Top played, Top rated, Coming Soon and Recommendations to discover new games, apps, and entertainment for your Xbox One. How do you feel about Microsoft increasing its focus on a more social and community experience? Do you feel co-op gaming will take a bigger step forward in gaming in 2016? Do any of these updates get you excited for gaming on Xbox in the future? Leave us a comment below to let us know how you feel.